SPRINGFIELD — The Illinois Supreme Court barred prosecutors from seeking a reckless homicide conviction against a motorcyclist Thursday, but the attorney general's office called it a victory anyway. "We won the war but lost the battle," said Solicitor General Gary S. Feinerman after the decision was released. "What's really important is that [the court] settled on a test for double jeopardy." In an opinion written by Justice Thomas L. Kilbride, the court determined that Lake County prosecutors couldn't pursue the reckless homicide charge against Mariusz Sienkiewicz because he had already pleaded guilty to reckless driving. In July 2000, Sienkiewicz drove a motorcycle north at more than 80 mph for nine miles on Interstate 94 where the posted speed limit was 55 mph. On an exit ramp in Gurnee, Sienkiewicz collided with a Ford Econoline van. The crash killed Anna Jaruga, who was a passenger on Sienkiewicz' motorcycle. Police issued the defendant a ticket for reckless driving that included "improper stopping in traffic, failure to signal when required, improper lane usage [and] traveling at 80 mph plus in a 55 mph zone." Sienkiewicz pleaded guilty and was sentenced to six months' probation and fined $250. That September, he was indicted for reckless homicide in connection with Jaruga's death. The defendant moved to dismiss the charges on double jeopardy grounds. A trial judge denied that motion, but a panel of the 2d District Appellate Court agreed with Sienkiewicz, prompting the high court appeal. The justices agreed with the reasoning of the Elgin-based reviewing court. "The elements of reckless driving are necessarily included in the proof required for a charge of reckless homicide. Moreover, the reckless driving statute contains no elements that are not also included in a reckless homicide charge," Kilbride wrote for the court. "Therefore, reckless driving is a lesser included offense of reckless homicide, and a conviction for the former bars a subsequent prosecution for the latter under fundamental principles of double jeopardy," he continued in an opinion that came without dissent. Feinerman, the solicitor general, pointed out that the test the high court used in its double-jeopardy analysis was the one advocated by his office. As in many instances when the Illinois Constitution echoes provisions in its federal counterpart, the state's high court typically links its interpretations of the double-jeopardy clause in the state charter to decisions interpreting the Fifth Amendment of the U.S. Constitution. 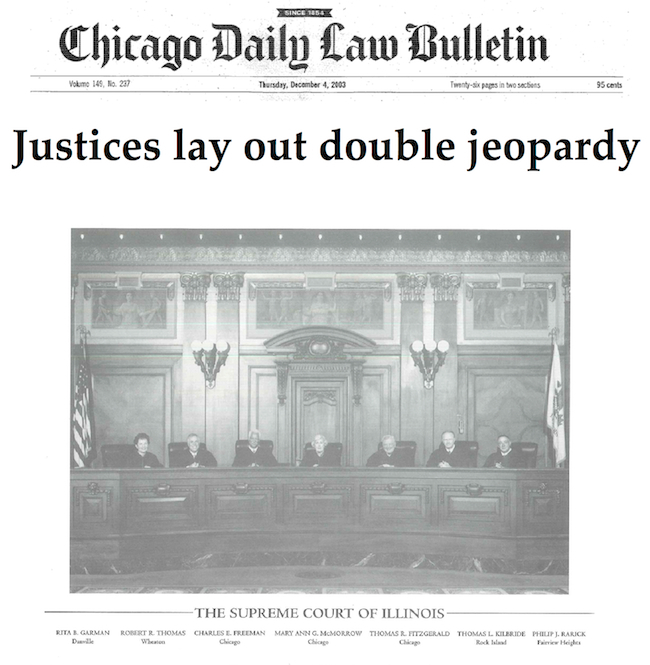 In 1932, the U.S. Supreme Court established the "same elements" test for determining whether double jeopardy applied. The court ruled that the government couldn't prosecute defendants for the same act under different statutes unless each statute "requires proof of an additional fact which the other does not." Blockburger v. United States, 284 U.S. 299. " But in 1990, the federal high court announced a new "same conduct" test that focused on the conduct the state had to prove rather than the elements of the offense. Grady v. Corbin, 495 U.S. 508, 521-522. That standard didn't last long in federal courts. Three years later, the U.S. Supreme Court reverted to the test it used in Blockburger. United States v. Dixon, 509 U.S. 688, 704. "same conduct" test in 1992, but the justices never followed their counterparts in Washington, D.C-, in backing-off from that rule. At least, not until Thursday. Feinerman praised the high court for reverting to the Blockburger test because "it is easier to apply and more faithful to the Constitution." Park Ridge attorney Peter C. Wachowski, who represented Sienkiewicz, said he had analyzed his client's case under the Blockburger test anyway. "In my situation, it didn't make a difference. It actually helped," he said. He also said he didn't think that part of the decision would hurt, other criminal defense attorneys. Wachowski said the most important aspect of court's decision was its conclusion that reckless driving is a lesser included offense of reckless homicide, because the issue was an "unanswered question" until Thursday. The whole situation could have been avoided if prosecutors and police had communicated better about the charges they wanted to bring, Wachowski added. Lake County State's Attorney Michael J. Waller, whose office filed the reckless homicide charge, said the high court decision was an "unfortunate result." "It won't happen again," he added. Waller said the confusion began because police issued the ticket while prosecutors 'were still investigating the reckless homicide charge. Since the accident, Lake County prosecutors and police have clarified procedures in potential homicide cases, so police-hold off on writing tickets until prosecutors decide whether to file other, charges, Waller said. He said the policy clarifications were proposed by a task force of police chiefs, fire chiefs and prosecutors updating protocols for homicide cases — not a direct result Sienkiewicz' case. Waller said the issue is one he has been dealing with for the 30 years he has been a prosecutor. The case is People v. Mariusz Sienkiewicz, No. 93970. In another opinion by Kilbride, the high court overturned a lower court decision that, a plaintiff attorney had argued, created "a situation where you are better off being struck by a car with no insurance than a car carrying legal minimum coverage." The legal discussion in the case centered on whether an insurance company ran afoul of requirements in the Insurance Code that require insurance companies to provide as much coverage for injuries caused by uninsured or underinsured motorists as they provide for bodily injury coverage. Customers can avoid paying higher premiums by explicitly rejecting the additional coverage. The Insurance Code states that every application for auto insurance "must contain a space for indicating the rejection of additional uninsured motorist coverage." Without the policyholder's signature in that space, the higher limits apply. 215 ILCS 5/143a-2(2). In the underlying case, the insurance company did not include the acceptance-or-rejection language on the application. It used a separate form instead. But the company claimed that the same-form rules for uninsured motorist' coverage didn't apply to underinsured motorist claims. The high court rejected that argument. "We have previously construed [the Illinois Vehicle Code] to provide that whatever uninsured motorist coverage the insured elects, underinsured motorist coverage will be set, mandatorily, at the uninsured motorist coverage level. Thus, it is apparent, that as [the plaintiff] argues, the two coverages are inextricably linked in the statute," Kilbride wrote for the court: "If the rejection of uninsured motorist coverage is ineffective because of a failure to comply with statutory requirements, it follows that coverage must be imposed in an amount equal to the bodily liability limits. Since underinsured coverage is mandatory where uninsured coverage in -excess of the-minimum statutory limits exists, it also follows that underinsured coverage, too, must be imposed in an amount equal to the bodily injury liability limits," he wrote. The court's decision means that the widow of a driver killed when he was pinned against his truck by another vehicle can recover up to $1 million from the insurance carrier for her late husband's employer, rather than $20,000. Vuong Y. Lee, etc. v. John Deere Insurance Company, etc., et at, No. 95337.